LEN - www.lankaenews.com | Duminda’s death sentence : How did LTTE arms come in to help Reno and Romelo’s heroin business ? Full judgment herein..
(Lanka e News – 14.Oct.2018, 1,45AM) Justice Priyasad Dep a most reputed chief justice who maintained his professional honor and dignity throughout his career ,delivered a historic judgment just a day before his going on retirement against the three accused including notorious Aramedura Lorenz Romelo Duminda Silva alias kudu Duminda in the Bharatha Lakshman multiple murder case which was contained in 55 pages .The text of the full verdict is appended. This Supreme court (SC) verdict written by Dep CJ rejecting the appeal made by the three accused including kudu Duminda was assented to by the other four judges of the panel.. The contention advanced by the lawyers in defense of kudu Duminda that the latter was shot at first had been most justly rejected. The reason cited by court was , that day ,since morning Duminda Silva an M.P. was outrageously and openly violating the election laws and was leading the groups to form unlawful assemblies. Even 5 mins. before the murders were committed he has been making death threats to the public about 500 meters away from the scene where the multiple murders were committed , the judgment reveals. An ASP who was on election duty too had been chased away . In the judgment is is stated ,without any doubt it has been proved , a T56 weapon had been kept in custody unlawfully . Besides it has been fully loaded, and 27 shots have been fired from it killing the victims instantaneously.. The allegation made by the lawyers for kudu Duminda that the CID had been gathering evidence with the whole intention to inflict punishment on Duminda was totally repudiated by the judges hearing the appeal .The reason cited by court was , when CID were gathering evidence Duminda was a powerful bigwig in the government of that time as well as a security monitoring M.P. Hence the CID was bound to perform its duties impartially. The judgment reveals how Duminda Silva and Reno De Silva have been using the illicit weapons of LTTE for their heroin business operations. The T 56 firearm used for the murders is that of the LTTE which was seized by them in 2000 when the Elephant pass camp of the forces was captured by it. That means Duminda Silva has received weapons of the LTTE. What is even more baffling and deplorable is , the Duminda group received this weapon on the fateful day from the ‘Kande Pansala’ where they had been kept hidden. That means the firearms of the LTTE terrorists have been kept hidden in the South in a temple of all places . These are armory temples.The irony of ironies is , it is the same rascally inmates of the Temples who at the same time are shouting and screaming that they are the Sinhala Buddhist heroes. Moreover , this is a strange Buddhist country where kudu Duminda Silvas and Reno De Silvas are able to parade as great Buddhists exhibiting the tooth relic, backed by criminal Gotabayas and corrupt Rajapakse Gorakayas with the help of the kudu (heroin)media channels of Reno Silva to dupe the people while committing gruesome murders on the roads. It is therefore the duty of true Buddhists to see to it such rascals and scoundrels are forbidden even to keep their hands on the sacred tooth relic , let alone speak of Buddhism. The true followers of Buddhism and the Buddhist priests must tell them to exhibit their own sinister tooth relic made out of their own kudu and illicit earnings instead . It is the same Romelos and Renos murdering innocents on the road and engaging in heroin business who are even deceiving the artistes in the country. These kudu magnates have grand ceremonies to distribute awards to actors and actresses spending their heroin business earnings. During these ceremonies , at least SL Rs. 20 million is paid to each of the Indian artistes who are got down . Yet the award winning local actors and actresses are only given a cash award of a meager Rs. 50,000.00 each which they have to collect from Reno’s office. In fact this is another subterfuge for it is through these ceremonies the illicit kudu earnings are laundered. It is the duty of genuine and bold artistes to boycott such ceremonies if they are truly concerned about the country. 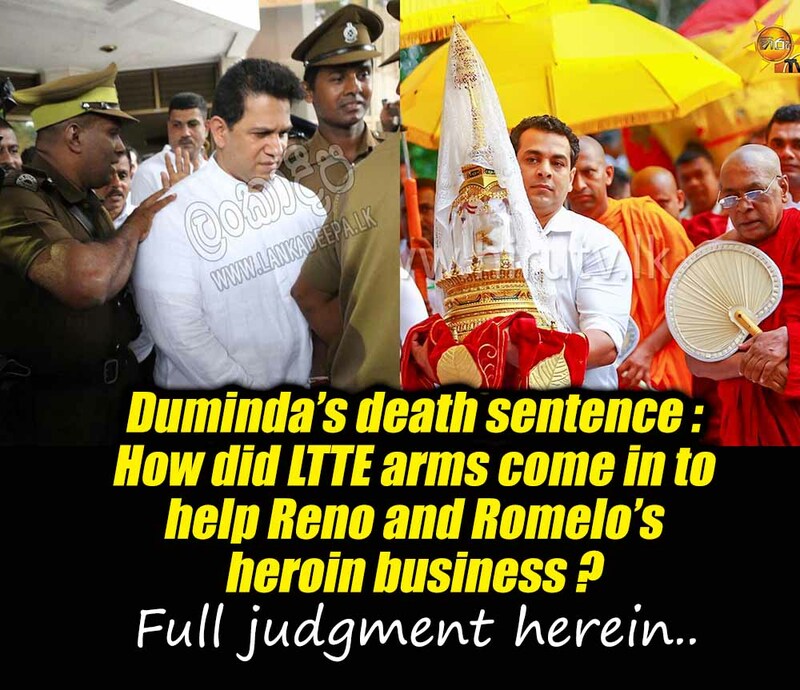 Following the death sentence delivered against Aramedura Lorenz Romelo Duminda Silva alias kudu Duminda , the Colombo Law society had something intriguing to say : It is Reno De Silva who carved the short cut to Romelo’s disaster they quipped . The reason for that is , Reno’s kudu channel carried out a huge publicity among the people that Romelo (kudu Duminda) will be acquitted of all charges by the appeal court . The kudu channel made a huge din about it while reporting only one side of the court proceedings . At the same time while paying colossal amounts as bribes to the venal journalists who are in plenty in that profession nowadays , they were influenced to create the opinion that Duminda will be freed. The publicity was such it became impossible for the public to avert the opinion that judges also took bribes from Reno . By that even the little faith and confidence in the judiciary was undermined. Hence, it is the view of the Law society owing to that , the judges had to deliver a judgment to confirm that the truth is otherwise , which meant it is Reno who courted death and disaster for Romelo the kudu magnate. No matter what , if the judgment is carefully read, it is very obvious the panel of judges who heard the appeal in this case have most scrupulously , scientifically , honorably and prudently arrived at the decision giving paramount importance to the country’s Democratic tenets and the sacrosanct laws to uphold justice and safeguard the independent judiciary. By clicking on the link below the judgment can be read.